Like GDP, balance of trade is one way to measure a nation’s economic performance, relative to its trade partners . 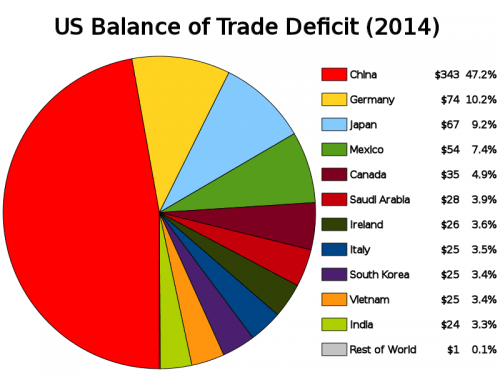 In the United States, there has been significant concern in recent years over the country’s balance of trade, because in many cases, the U.S. has a trade deficit with its global trade partners . What this means is simply that the value of goods and services America is importing exceeds the value of what it exports. On paper, this is similar to a budget deficit, in which the country is spending more money than it raises in taxes. Economists and financial specialists from all political backgrounds debate over what to do about America’s trade deficit, whether the deficit is being measured correctly, and even whether such a deficit is truly a problem that needs solving . Amid all this research and debate, a policy prescription has emerged, which would target America’s trade policy as part of a comprehensive tax reform program. The part of this reform bill which specifically addresses international trade — and the trade deficit — is known as the Border Adjustment Tax . For students pursuing their Master of Taxation or LLM in Taxation online, the Border Adjustment Tax and the surrounding tax issues will be a recurring topic of study and discussion. Before examining the Border Adjustment Tax in detail, it is important to consider the context surrounding its development and debate. One of the leading causes of America’s trade deficit is the behavior of its major corporations; specifically, the trend of moving production (especially manufacturing) outside of the U.S., a trend commonly known as outsourcing. Part of the reason behind this trend is that companies based in the U.S. are able to do the bulk of their product development and design domestically, then have the production and assembly work completed overseas at lower costs than can be attained locally. The side-effect of this is that all the products these companies sell in the U.S. have to be imported. Aside from contributing to America’s overall trade deficit, this arrangement of labor and retail can sometimes obscure the full extent of America’s export patterns. Intellectual property (IP), generally, is counted and accounted separately from imports and exports . Most commonly, IP rights are a point of leverage allowing a nation to expand its exports: consider the Apple iPhone, conceived, designed, programmed, and developed largely in the U.S., but primarily manufactured and assembled abroad . Although the sales are all accrued by an American company, and a good share of its sales are reckoned as exports on U.S. trade balance sheets, all of those phones assembled abroad are counted as imports when they come to the U.S. for sale, and therefore count against the trade balance of the U.S. with those nations who export the final product to market . The IP that guides the design and manufacture of the iPhone could be tabulated as something called a service export; that is, an intangible “product” of discrete value, which is then exported abroad to facilitate the production and retail of the “real” goods, in this case, smart phones. However, there is substantial ambiguity and inconsistency in the classification and calculation of these service exports, such that their impact on the country’s trade balance sheets is difficult to pinpoint . How Corporate Taxes are Currently Levied in the U.S. The other major source of concern addressed by the Border Adjustment Tax is America’s federal corporate income tax rate, more commonly abbreviated to the corporate tax rate. In principle, the corporate tax rate is simply an income tax levied against a corporation’s profits; in the U.S., the statutory rate is 35 percent . Just like individual income taxes, corporate tax rates are a key string national leaders can pull in order to influence the balance of trade and the behavior of corporations. This is achieved by a combination of exemptions and deductions available to corporations based on a huge array of different programs, behaviors, and expenses businesses may report on their tax returns . For example, corporations are able to deduct a portion of their contributions to employee healthcare or retirement plans, and other non-wage benefits programs. Because of the number and scale of exemptions and deductions available to American corporate taxpayers, the laws and filing process has become quite complex, and the actual tax rates paid by many corporations varies significantly from the actual, statutory rate . This, in part, is why the corporate tax rate has been a prominent target for lawmakers and citizens advocating for comprehensive tax reform. The corporate tax rate is cogent to the Border Adjustment Tax because under current policy, corporations have tax incentives to keep profits offshore in foreign banks and investment accounts, so they do not have to be declared as income in the U.S. . Until the money is repatriated to the U.S., it is not counted as taxable income, and can help corporations pay a lower effective tax rate. While this allows corporations to reduce their tax burden without compromising their overall profitability, it keeps significant sums of money — trillions of dollars — effectively isolated from the American economy at large . All of this sets the stage for ongoing efforts in Congress to reform American tax policy and reduce the trade deficit. There are several tools governments can use to try to move the needle on their balance of trade. The most common, and the ones getting the most discussion, are tariffs, Value-Added Taxes (VAT), and adjusting the corporate tax rate. This is one of the most common points of confusion where the Border Adjustment Tax is discussed. Tariffs are taxes levied “at the border” on imported goods; in other words, a border tax . Outside of the name and the focus on trade, however, this tax instrument has important differences from the alternative Border Adjustment Tax. Depending on the rules of the tariff, taxes could be applied to all imports, those from a selection of nations, or even on a specific range of imported goods. In this respect, tariffs are more nimble and flexible than Border-Adjustment taxes, because they can be levied and repealed piecemeal. For example, a tariff may be levied against Chinese tires, to offset that country’s own efforts to subsidize its domestic tire manufacturers and sell their goods abroad at lower prices than would normally be possible. Tariffs are selective taxes, rather than a comprehensive tax policy instrument . Another key difference is in how the impact of taxes are felt. The cost of tariffs, by and large, is passed onto consumers in the form of higher priced imports. It doesn’t immediately or directly impact the cost of production, or the corporate tax rate . The North American Free Trade Agreement, or NAFTA, is an agreement between the U.S., Canada, and Mexico to eliminate all tariffs on goods imported by member countries, in order to facilitate increased trade and international economic cooperation . NAFTA has come under scrutiny and criticism in part because it limits the ability of member nations to utilize tools like tariffs to address trade deficits or other global competitiveness challenges. A Valued-Added Tax (VAT), is functionally similar to a sales tax, except it is levied at each point of production, rather than just the final sale . For example, rather than a sales tax levied on food purchased at a grocery store, a VAT would tax the farmer selling raw goods to a cook; when the cook sells his or her wares to the grocery store, that transaction would also be taxed; and so on . The benefit in the global supply chain is that it limits the impact felt directly by consumers, but could still be used to generate more tax revenue. The VAT program could allow the U.S. to tax the production of goods without respect to where they are finally sold, enabling the country to reduce the corporate tax rate while simultaneously increasing revenues based on the production of American companies around the world . Unlike tariffs, which are expressly forbidden under NAFTA, VAT are allowed, as they do not target specific products or source nations . Finally, some advocates for tax reform insist that America’s 35 percent statutory corporate tax rate is too high. Cutting this rate, and reforming policy to simplify and streamline the collection of corporate income taxes, could make it more attractive to companies to locate more of their production domestically, instead of abroad. This would shift the balance of trade back into America, increase exports, and could theoretically allow the country to collect more tax revenues, while still giving companies relief on their taxes . Focusing exclusively on the corporate tax rate, rather than on tariffs or creating a new VAT, is not inherently simpler than any of the policy alternatives. In particular, balancing a lowered statutory rate with the removal of loopholes and incentives, could significantly impact overall federal revenues, adding to America’s budget deficit at the expense of balancing its trade deficit. Advocates suggest that the boost to American jobs and global competitiveness could offset this loss of revenues, but the issue remains controversial . The Border Adjustment Tax, as proposed by Congressional Republicans, is designed to do several things at once, as part of a comprehensive tax reform bill. It would levy a tax on all imports, unlike the selective taxes levied by a tariff . At the same time, the Border Adjustment Tax would exempt exports from taxation, effectively creating an incentive for corporations to relocate more elements of their production inside the U.S., maximizing exports and minimizing imports . This incentive on its own is intended to drive corporations to shift America’s balance of trade away from importing the bulk of its consumer goods, and toward exporting more. The Border Adjustment Tax would be conditional upon a reduction of the overall corporate tax rate, reducing the tax burden on corporate profits while simultaneously changing the rules for which profits would be subject to the tax . This, combined with the destination-based taxation described above, would effectively broaden the tax-base for corporate taxation, and reduce the ability of corporations to hide profits offshore in order to avoid incurring additional income taxes . The relocation of production is further intended to boost job creation inside the U.S., as more labor would be required domestically in manufacturing and other functions along the supply chain . Like all tax policies, the Border Adjustment Tax may have unintended consequences, depending on how it is implemented. Although an across-the-board tax on imports could, similarly to a VAT, be allowed under the terms of NAFTA, it could cause a fluctuation in the value of American dollars . Economists disagree on what the likeliest situation would be, but changes to the value of American currency could directly affect the prices and competitiveness of American exports around the world; this, in turn, might change global demand for America’s exports, potentially changing the balance of trade all over again . The impact on employment trends inside the U.S. is also difficult to predict. Changes to the value of the dollar, along with the reshoring of manufacturing and production jobs, could drive American wages up, but this is not guaranteed or agreed upon by analysts of the Border Adjustment Tax plan . Finally, the World Trade Organization (WTO) may take issue with the Border Adjustment Tax and how it affects the trade relationship between the U.S. and the rest of the world . It may object, or even enable other countries to sue the U.S. for violating WTO rules . The future of tax policy in the U.S. is never fully written; changes to technology, employment, global trade and international relations, all have an effect on tax revenues. The popular attitude of taxpayers and corporations can also fluctuate, making it difficult to predict behavior in response to changes to the tax code. Whether it will take comprehensive tax reform, or more piecemeal changes to adjust the nation’s balance of trade, remains to be seen.